How could I possibly know such an astounding fact? Well in line with my recent posts and upcoming half marathon, this months music of the month has a run theme, so rather than go with my traditional genres (indie, rock, soundtracks, etc) I decided to be more specific. During my last session I noticed there were quite a few tracks on my playlist which specifically referenced what I was up to, so when I got back I had a quick shifty at the library and realised how many potential candidates there were. In fact it was even more at first, but it turned out I have a ton of albums with titles such as Running Trax (sic) which I had to exclude on principal. First up, I need to come clean: I am a terrible runner. Part of it is genetic, I am just not the right size to be able to run like an elegant gazelle (more of a charging hippo…) and have previously mentioned how I remember coming last in a school cross country race, a small event which has nonetheless played its part in my challenges of recent years. The other aspect is that I have the multi-sport athlete’s curse of preferring to train in my stronger events. By this I mean that while many coaches advocate spending the most time on your weakest event, on the basis that it will bring the biggest gains and ensure a balanced race, I find it hard to get motivated to run and tend to focus on the bike and swim legs. 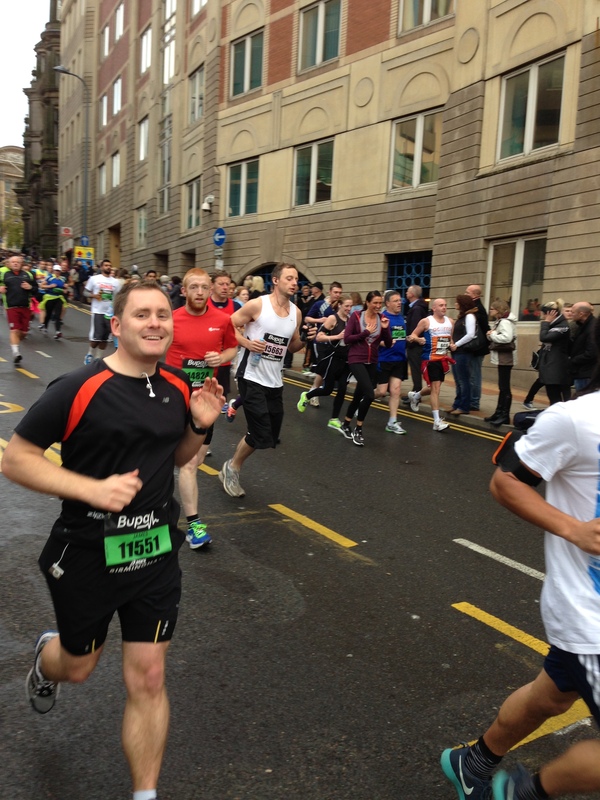 It was around this time last year that I realised how much work I needed to put in, and this led to me entering the Birmingham Half Marathon – something I would have found hilarious a year or so before. As a result I had to start putting down some serious mileage, and whilst it did not necessarily make me like running any more, I did manage to prove to myself I could do it. The second half marathon I did was this year at the end of the Avenger, and if I thought the first was tough this was in a different league… So it is with a bit of trepidation that I am back preparing again for the Birmingham half again, wondering if my body is still up to it. I did manage to get in my first long run in a good few months yesterday, but judging by the feeling in my knees and quads at the moment some more practice is definitely required. The problem is, I have a bit of a dilemma. Whilst I know the right thing to do is spend the next month really focusing on my running, I also have the challenge to think of. This is similar to the issue I had earlier in the year with swimming, in that whilst I can top out at a whole 3 km per hour in the water, I can cover 30 km on the bike in the same time, or in this case, somewhere in-between at an average speed of 10 km on foot. I still have another 1000 km to cover in the next three months, so of the three have a guess which is the easiest way to make this? The solution therefore is going to have to be the same. Whereas with swimming I decided that every 1 km covered would count at 5 km towards the challenge (otherwise I would never bother getting wet) so from now on (for at least the next month anyway) every kilometer I cover on the run will count as 3 km for the Chile Challenge. For the mathematically challenged this means a 10 km run = 30 km for the challenge. So starting retrospectively I am going to count yesterday’s 16 km run (oh my poor legs, etc) as 48 km towards the total. Hopefully this little extra bit of motivation will get me through the next month or so, and not only help me cover more distance, but actually improve my weakest area and get me through the race! And so, the final triathlon of this long season is complete. A full Olympic distance race at what seems to have become one of the homes of UK racing: Dorney Lake. As I mentioned before this was my fifth time at this venue, so I know it fairly well by now. That said, things did not start brilliantly. I had vague memories of the route being fairly easy from before, so did not bother with sat-nav. First mistake, as I missed the motorway exit, meaning I had to go through Slough to get there, which added another 10-15 mins. No big deal normally, but despite the fact I was in the first race of the day, the place seemed packed by the time I got there. The layout of the car park means you have a good 2o minute walk from the car to registration, the majority of it being along the run course (in fact my car was parked just by the turning marker). Now every other time I have been here you just walk straight in to collect your timing chip, etc, but for some reason today it was packed. With 40 mins to go until my wave set off I had a long looking queue ahead, and eventually realised it was because for the first time you now have to pay a separate £6 for day membership to British Triathlon. Understandable, but annoying and terribly organised, as people took longer to locate their change, plus people from later races were checking in early which just made the queue worse. In the end I got through and into transition with about 20 mins to spare – long enough to set up but not exactly relaxing, and no chance to visit the facilities first either. Fortunately I knew the site well, so did not have to spend long planning my transition, but I am sure for others it will really not have helped. Not my best time ever here, but not my worst either. Energy wise I was fine, and I even managed to avoid any whacks despite my wave being fairly busy. The water was fairly warm for a change (18.1 degrees) although as a result seemed fairly murky. I think this led to my main problem, in that my trusty Aquasphere goggles, which I have used for every race here before, fogged up really badly to the point where I could only see a short distance in front. Combined with this the sun came out on the reverse lap, which meant visibility was even worse with clear lenses. The problem with this is that it becomes a lot harder to swim in a straight line (i.e. most efficiently) and I have a feeling an aerial photo of my route would look a bit like our own spaghetti junction. As a result I probably lost a minute or two going off track and stopping to check where I was like some sort of aquatic meerkat! This leg involves a fairly unexciting 8 laps of the lake / river, around and around and around and so on. The first few laps were pretty quiet as it was only my wave on the bike route, but it got a bit more interesting after a few when the next races started to finish their swims. As always there was some wind on the course, but for a change you were riding into it during the second half on the return, rather than the way out. The laps tend to blur into one, but fortunately my lovely wife was cheering me on and counting down the laps each time I passed, which helped me keep going to the end. There is one spot that always gets me on this bike route, about halfway round between a set of gates. The first year I did this race I dropped one of my bike gloves (I had them in my back pocket after deciding I would not use them), the second year I dropped some energy sweets I had on me, and the third time my water bottle when I missed the rack. This time did not disappoint, in that whilst trying to adjust my race belt one of the poppers that clips the number on flew off and into the grass, never to be seen again and most likely resulting in me needing a new one for next year. Still, it could be worse as I saw someone had dropped a pair of red sunglasses in the same spot, so clearly an equipment graveyard! I am pretty impressed with the consistency here, in that my time works out at exactly 12 minutes per lap, which was pretty much spot on my expectations. 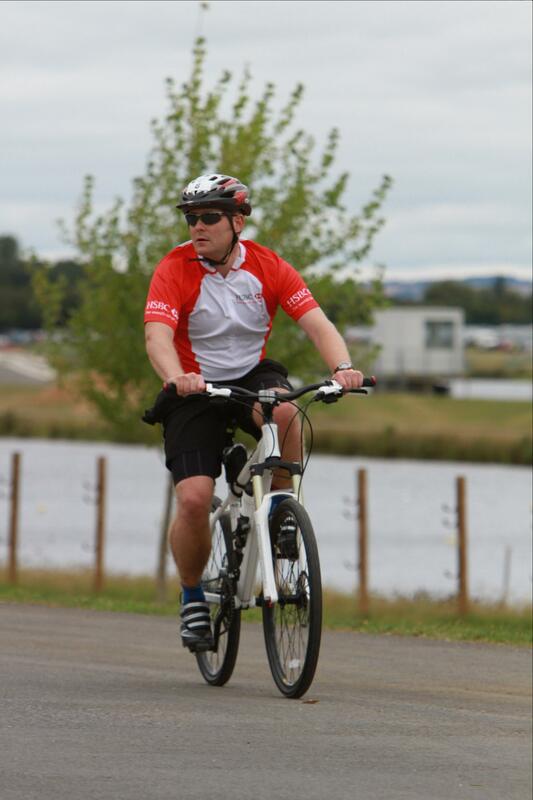 The biggest difference was clearly having my road bike as opposed to the mountain bike in the others, which added around 2 or 3 minutes per lap and was really noticeable in my legs. I am still not convinced I am using the gears as efficiently as I could be, but overall the bike did a great job with no mechanical issues and the pedals clipping in nicely. As above, this is not the most exciting run in the world: 4 laps of 2.5 km up along the lake, around a marker and then back again. Still, the lack of scenery is made up for by some great support, and particularly as you approach the turn there are hundreds of people cheering you on, kids giving high-fives, and so on, which really helps keep you going. The run is on concrete, and by the time I reached this point my legs were fairly shot, so the first lap at least was more of a hobble. 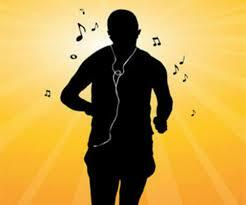 From there on I switched to the more sporty shuffle, a kind of way of halfway between a walk and run. If you can’t picture what I am talking about get down to a triathlon and you will see what most people are doing. But as with my last race, the main thing was I did not actually walk for any of this part, although I am not convinced I actually went any faster. In fact this was probably the slowest 10 km I have done, but in the end I was so pleased with the earlier part I was not that bothered. Considering I managed to take a whole half hour off my time from two years ago I have to be happy with this outcome. As I suspected, not having a mountain bike made a massive difference, but I would like to think that being a bit fitter and race experience played its own part. I could probably have taken 10 mins or so off on the run, and with some more practice the bike will come down, but overall it was well inside my target time of 3.5 hours. I even managed to beat a few of the relay teams, which was something of an achievement considering they were only doing the race in sections. This is usually a really well organised event, and in previous years I would have been pushing for a maximum score, but unfortunately the issue with registering knocks things down. A shame, as other than that the event itself was as slick as usual, and the marshals, photographers and other assorted helpers were all great. … This is where they win their money back, as it always has a fantastic atmosphere, with thousands of supporters and competitors giving you encouragement as you race around. It really does make all the difference, and I have to make a special mention again of my wife for having the patience to watch me go around and around, and keep cheering me on with a smile every time I passed. And that is it for the triathlon season: time to hang up the wetsuit and get out the turbo for some indoor bike training. But no rest for the wicked, as the Chile Challenge (literally) marches on, with over 1000 km to go. Next stop is the Birmingham Half Marathon at the end of October, so time to get practicing some more runs and see how much I can take off last years time! I do not follow any official tapering plan, but just tend to try and ease off from my usual training. That means plenty of swimming and stretching, and only light cycling. I tend not to run as that takes me longest to recover, instead doing something lower impact such as cross-training. Basically my rule is do enough to stay fit, but don’t get injured! One of the downsides to the distance challenge I am doing this year is trying to keep up enough miles, which has meant I have done more than usual this week, such as a spin class on Thursday, but on a more positive note my body must be more used to taking a beating, as I do not seem to have any delayed aches today. Definitely a day to take it easy! At most a light swim, but not much more. Today was a bit different and I went to the golf range to hit a few balls, but I had a longer swim last night so felt like mixing things up. Aside from that, I will be relaxing and watching action movies to get in the racing mindset. 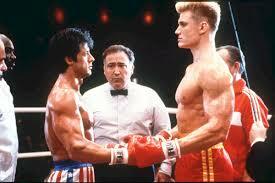 The classic is of course Rocky (IV being my preference, but III on occasions), and other favourites include Gladiator, Top Gun, Point Break, Iron Man (natch) or anything with Arnie in it! Today is a bit different and I am watching The Raid at the moment, which seems about right so far. I have not written yet about nutrition, a topic I will cover in more detail another day, but this morning I had scrambled eggs on bagels, and tonight will be having my wife’s fantastic tuna pasta bake, something of a tradition in this house. The main thing is eating a good balance of carbs for energy the next day, whilst not upsetting my stomach: the last thing you want in a race is an unscheduled pit stop… The other aspect is drinking plenty of fluids to stay hydrated, although not too much caffeine in the afternoon, as sleeping is not always easy before a big race. Various Bags & Rucksacks to put it all in! This depends slightly on what time I need to register for the race and how far away it is. Being based in the middle of the UK I can get to most places within a few hours, which is important as this is an expensive enough hobby on its own, without having to pay for hotels on top. I am in the first wave tomorrow, which kicks off at 10 am, and I need to be there to register an hour before. Allowing a couple of hours for the drive, means I will leave at 7, so be up around 6 ish. Breakfast is usually porridge with raisins and honey, slow release carbs to keep going as long as possible. I can’t usually eat that much more, but might have some peanut butter on toast if I am starting a bit later. Again plenty of squash to stay hydrated, but that is about it. T2 is slightly less exciting as there is no wetsuit (and you are dry!) so first thing is to rack the bike, then helmet and accessories off. Depending on distance I might change clothes (shorter than an Olympic and you don’t really have time), then swap the bike shoes for trainers and get back on the road! Even with all the race nutrition, you always finish a race thirsty. Maybe it is posing for all the post race photos or the weight of the finisher’s medal! Tomorrow’s event always has great coconut water at the finish line and, as with almost all my training sessions, a milkshake is another essential. A special mention needs to go to the Peak District triathlon for having the decency to offer a pint on the line, even if it was alcohol free! We also have one last tradition for this event: a massive burger & chips at Oxford Service station off the M40 on the way home. It is not fancy, but believe me it will be well deserved! 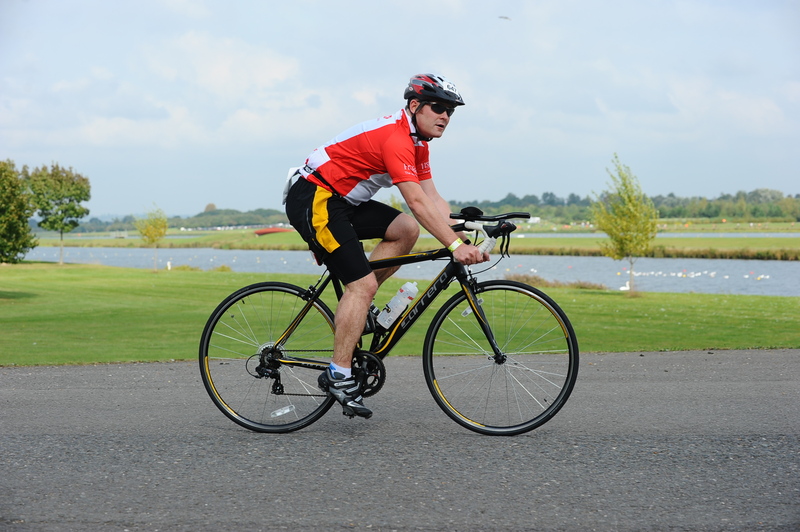 As we left things yesterday, I had just (slightly unwittingly) signed up for my first triathlon in September 2010: my role would be to do the first 1500 m swim leg in the luscious sounding Eton Dorney lake, near Windsor. I did not know anything about triathlon, other than the sports involved, and had never seen one before. 1500 m is 60 lengths of an average pool (it is known as a ‘pool mile’), but this was an open water swim there were had no sides to kick off from, and it would be the furthest I had ever swum in open water. The lake was less exciting than it sounded, being less crystal clear oasis and more murky wide canal, and was also closer to the significantly less glamorous Slough than Windsor. It was likely to be freezing, necessitating a wetsuit. Although I had plenty of experience with wetsuits from other aquatic sports, I had never swim any distance in one. I only had a few months to get into training for the race! After this reality bite, my first task was to get myself equipped with a wetsuit – the mighty Wiggle website locating me an Orca S2 (aka the cheapest one available). Amazingly it actually fitted quite well and proved very reliable – in fact I still wear it now. Kitted out, I then needed somewhere to train, and found a small lake about 10 miles away which offered open water sessions on a Sunday morning. It was not the most exciting place, but again did the job, and that summer I managed to get in a decent amount of training. Come the big day, I met my relay team mates for the first time, and was relieved to found out they knew no more about what was going on than me. I was up first, with the shortest (but obviously toughest) section of the race to complete, and wetsuit on I got myself down to the water. 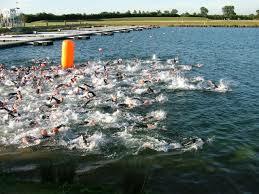 This was to be my first experience of the fabled triathlon swim start. I have probably said this before, but it reminds me of Dan Ackroyd’s line in Trading Places: “Nothing you have ever experienced can prepare you for the absolute carnage you are about to witness”. It is crazy, bodies everywhere, flailing limbs, splashing water, zero visibility. I loved it immediately! The swim itself did not quite go to plan: all the things I had been practicing such as bilateral breathing, alternate sighting, tight turns on the buoys… went out the window after about 5 minutes! Basically it turned into – just keep swimming – reverting to single side breathing to be able to take in enough oxygen, following the guy in front’s feet with the hope they were going in the right direction, and trying to ignore the massive pain in my side, which was either from being whacked or over-exertion. Crossing the finish line was massive, and one of my favourite parts of this particular triathlon, as they have a huge inflatable archway to mark the end of the swim. Although I was handing onto my partner to do the bike leg, it did feel like crossing a finish line, and I had a huge sense of achievement. I was even happier when I found out my time, of just over 30 minutes, and the fact I had come about halfway in my wave, a pretty decent result for a first time. Before the race I had thought that would be the end of it, a fun one-off, but looking at everything going on around me I was enthralled. The transition area was amazing: people flying out of the water, throwing wetsuits and clothing on and off, and barely pausing before zooming out the other side. The equipment was also awesome, with racing bikes of the like I never knew existed, futuristic looking helmets, strange food and drink that came in squeezy packs, and so on. I promised myself that I would get there myself someday. Later on that year I received an email saying entries were opening for the 2011 race, and thought ‘why not’. I signed up for the sprint distance, a 750 m swim, 20 km bike ride and 5 km run. 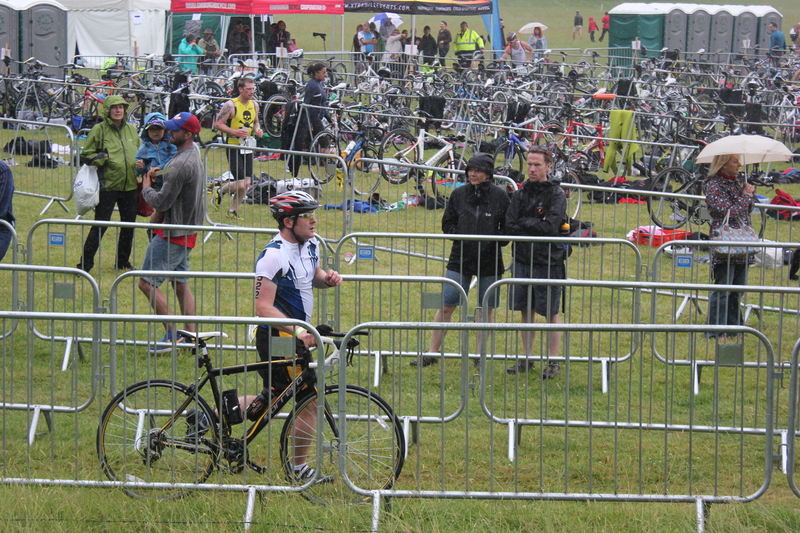 I knew the swim would be fine, having done longer that year, but did not actually own a bike, and had never run 5 km. So as with the previous year, the first step was to get myself kitted out, by signing up for the Cycle to Work scheme, and getting down to Halfords. First mistake, was getting talked into going for a mountain bike by the teenage kid who worked there – perhaps he did not believe I was really going to be racing – the problems with which I have covered extensively in earlier blogs. Long story short, I never had any mechanical problems with the bike, it was just the slowest thing you have ever seen and totally inappropriate for this particular race. Still, it did the job, and I made myself a training plan to get into shape for the various disciplines – including the dreaded run training. By the time I reached September I was pretty comfortable, and the race went really well. If memory serves I did it in around 1.57, which given the bike I had was a great effort. The particular memory I have from that day was how cold it was, and when I came out of the swim leg my hands were too cold to undo the zip on the back of my wetsuit. As I was running / hobbling to my transition spot I saw a mate, and they helped me get the zip going (lucky I did not get DQd! ), otherwise who knows how long I would have been there. 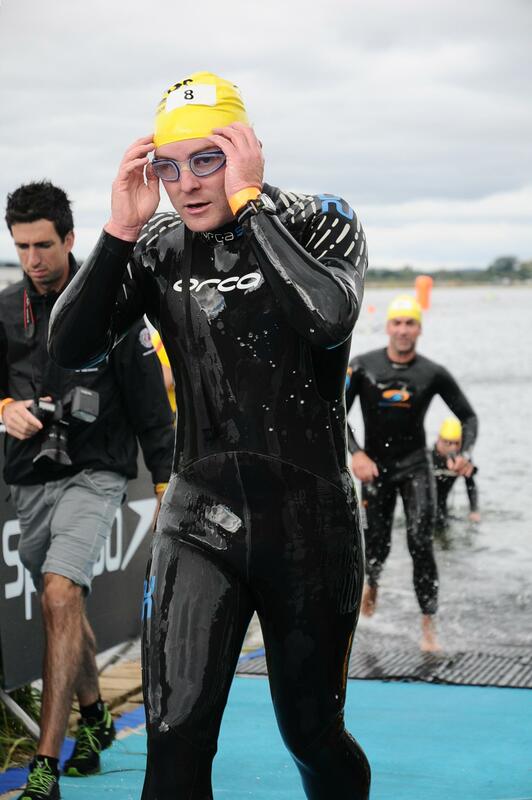 So 12 months later, in September 2012, I was lined up in the same spot for the full 1500 m swim, 43 km bike and 10 km run. I had been so eager to get involved I had replied as soon as the entries came out, and had race number 3 which showed how quickly I must have done it. On the downside, it was a few months after the venue had been used for the rowing at the London Olympics, and with the stadium still partly dismantled someone had kindly extended the bike leg, which was just great. But once again, the race went really well. I had tried to mitigate the bike issue by purchasing some smoother tyres, rather than the knobbly off-road ones I used in the previous year, and although it was not quick it did help out a bit. I have a feeling my time was around 3.53 that year, and whilst psyched to have finished a full triathlon, it did seem a little slow. 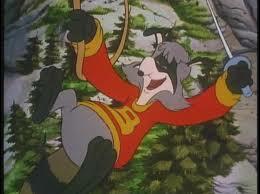 That familiar feeling occurred, that I could do more, but it had to hold off a bit as we reached 2013. Spending three weeks in Chile in the summer meant I could not get in as much training, so I stepped back to the sprint distance and this time around got my time down to 1.48. 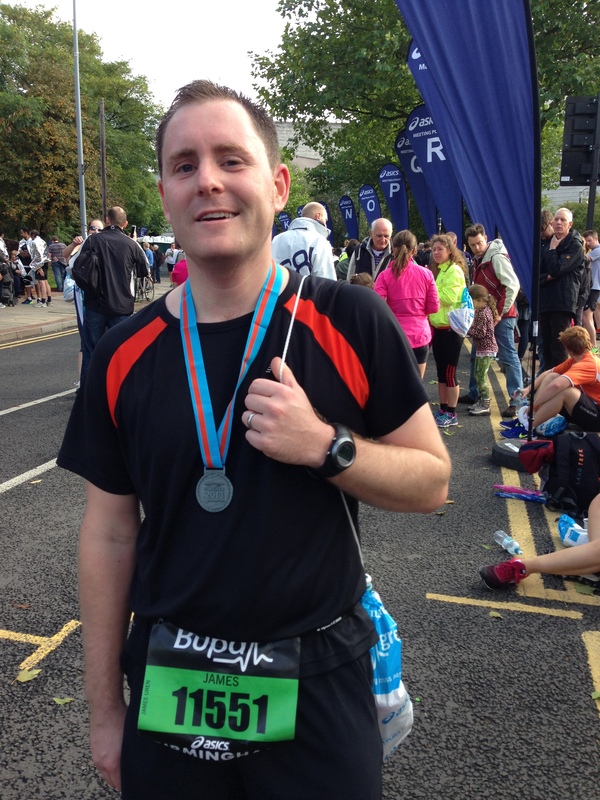 I also decided to do something different and entered the Birmingham Half Marathon, a massive step up, as even with all the training I had been doing I still was not a big running fan, and had not done more than 14 or 15 km. Being in late October though, meant I had some more time to prepare, and I was delighted to finish my first ever Half in 2.11. The voices… Yes they were back, and after completing an Olympic Distance triathlon and Half Marathon in consecutive years, I needed the next challenge. As with all great ideas this one happened on New Year’s Eve, where I decided I was going to commit to doing a half-iron distance race, signed up for the Avenger Triathlon. Realising this would require a lot more preparation than I was used to, I decided to start writing about it to both track my training and keep myself motivated. On that day the Chile Challenge was born…! This week marks an important date in racing history: my Triathlon Anniversary! 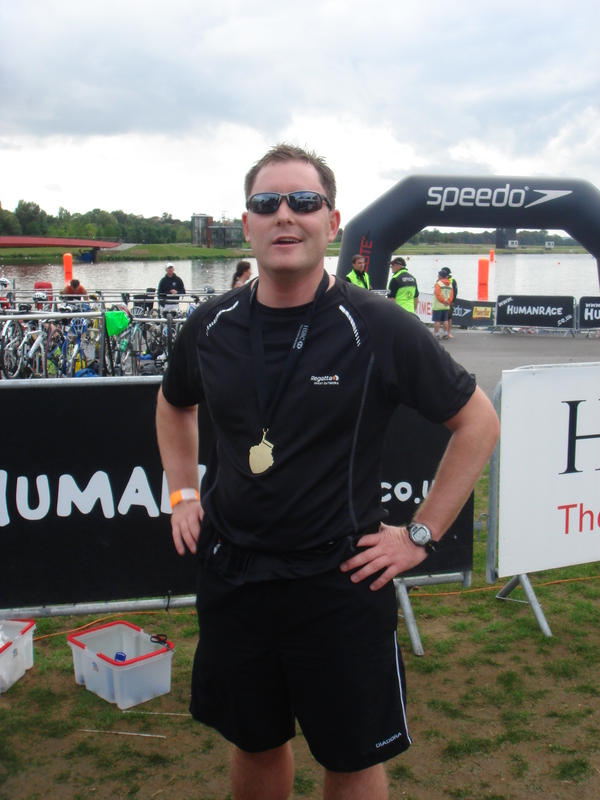 Sunday will be the fifth year running I will be competing in the Human Race triathlon at Eton Dorney, so seems an appropriate enough opportunity to explain the title of this blog, and how I ended up here. 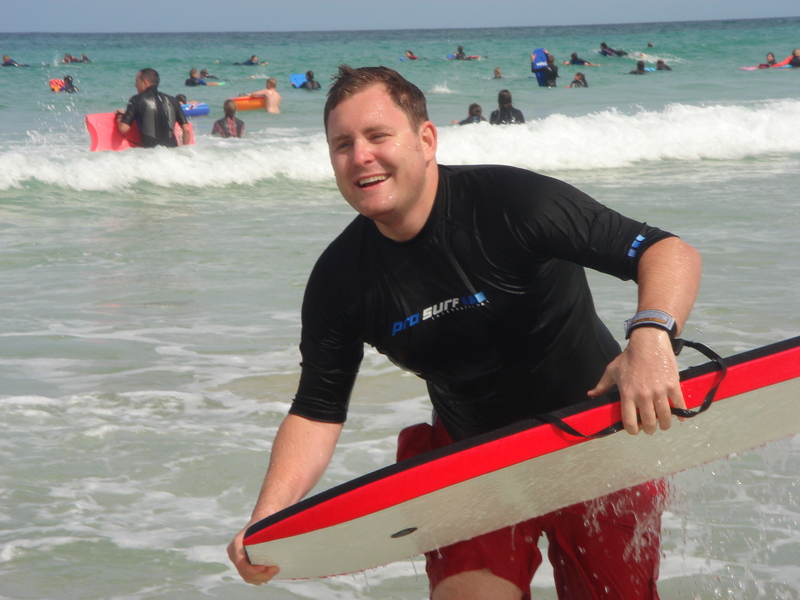 I also liked individual challenges, and growing up by the sea I particularly loved water based sports, spending my summers surfing, sailing, kayaking and latterly scuba diving. I learned to swim when I was very young, and although I never really raced I was always comfortable in open water, and even spent four years working as a lifeguard in my late teens. When I got to uni I continued playing rugby, before realizing that stepping up to men’s level combined with an unhealthy consumption of alcohol in my first term was not a good combination, and after one particular neck injury I decided it was time to retire. Looking for an alternative to keep me busy, it came as so many great ideas do – on a drunken night out on Broad Street in Birmingham. 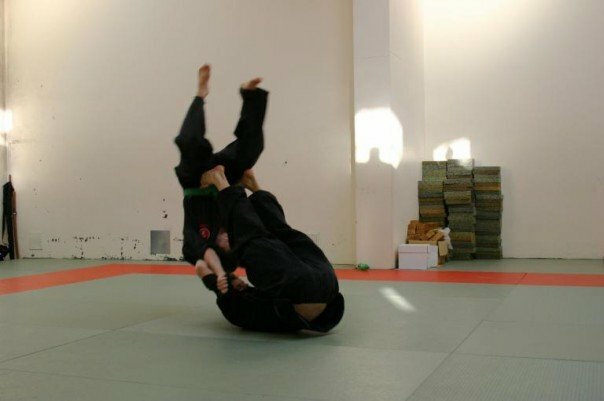 Whilst reenacting a few scenes from Enter the Dragon outside a club, my mate casually announced that his flatmates were training to be ninjas in a uni society. That sounded like the coolest thing ever, so we decided to go along to their next training session. It was fantastic: wearing black, leaping around, weapons training, night missions, plus being able to tell people you were a ninja! I even managed to meet my wife there – her beating me up not the other way around! 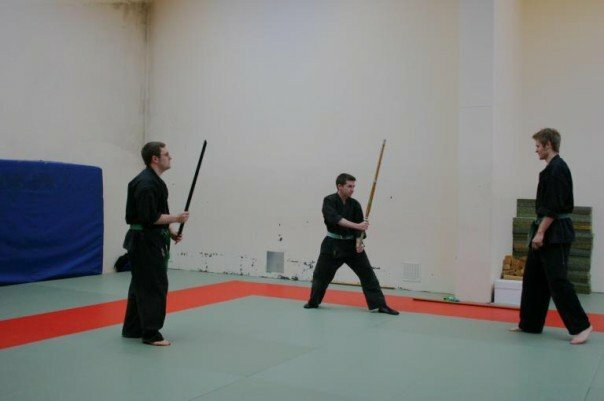 So for the next 3 years or so I was training three times a week, to the point where I realised I was spending about as much time in the dojo as I did in lectures, but towards the end I had to wind down, particularly once my co-ninjas started getting jobs and moving away. By the time I started working I was back to square one, needing a hobby to keep me busy, as well as reasonably fit. Fortunately my job came with a gym membership included – well if you could call a few token machines in the back of a hotel a gym – so I started to go fairly regularly. I had no real purpose though, tending to just and use as many different machines as possible and (as most kids at my gym do) usually focused on the guns! After that I managed to join a decent gym closer to home, which also had a pool, so after a fairly long gap I started getting back into swimming. Stay tuned for another exciting update of An Accidental Triathlete: coming soon! When you are wrapped up in a year long event such as this, with every spare evening and weekend spent training, it is easy to lose track of what is happening in the real world. Although the Chile Challenge is partly for myself, something to help motivate me through hours of training for long distance events by tracking distance and writing about it afterwards, it has also been a great way to raise money for charity by doing something a bit different. Despite this, it seems to have been more difficult to get sponsorship in recent months, as there are a lot of charitable things going on at the moment: the Ice Bucket Challenge, Go Sober October, Movember, the list goes on. My own office is in the midst of its own charity week, raising funds for The Hope Foundation in India, linked to our sister office in Kolkata, which has included classics such as a cake sale (people actually paid real money for my homemade brownies! ), fundraising t-shirts and so on. The main thrust of the week however, is that our 80 staff who are split between six sites, have been ‘virtually’ climbing the six highest mountains in the World – Everest, Kilimanjaro et al. 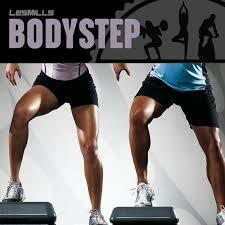 This distance of 117,266 feet or 200,000 steps, works out at 420 steps per person per day. Essentially it is the same concept as the Chile Challenge, where the equivalent mileage is completed from home, but the thought is there to use as a target. 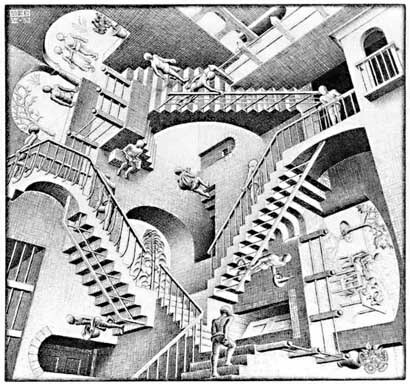 Each of our workplaces are different so I am not sure how other offices have been doing their sections, but we are based in a charming 11 floor concrete miracle in central Birmingham, which with 20 steps per level is actually perfect for a challenge such as this. The mathematicians among you will have worked out that by doing two full climbs you have 11 x 20 x 2 = 440 steps, which is bang on our daily target. For the last week therefore, we have had twice daily processions of the whole team heading down from the third floor to do the ‘staircase challenge’ together like some sort of bizarre fire drill in reverse, and it has actually been pretty good fun (perhaps more for some of us than others!) and a great way of getting everyone together. As someone who avoids using the lift where possible, I have been taking the stairs to my floor all year, but after this I think it may become part of my morning routine in future, perhaps even bringing my grey tracksuit to go the full Rocky! So after climbing well over 2000 steps in 5 days, what could be more appropriate than a few classes to finish off my legs altogether? In addition to my usual Monday night Combat Class, which involves numerous kicks and squats, I found myself in a Les Mills Cycling Class on Thursday evening, with even more hill climbs and sprints for my aching quads and hamstrings. Not content with me barely being able to get upstairs, my wife then convinced me into taking it to the ultimate level – a Step Class! Yes, any feeling I had left in my knees or ankle joints is now well and truly gone after spending 55 minutes jumping up and down to ‘party’ music. Well, on that bombshell, I think it is best to spend the rest of the weekend taking it easy (or tapering as the pros say) and hopefully my leg muscles will deflate enough for me to be able to get back to work again on Monday!